A future is the uncovering of events scripted in buried memories. This may be precisely what is occurring to contemporary painting, at least in the case of an artist like Ann Craven. Except that, for an artist today, memory consists less in what is remembered from an “examined life” than what one encounters in photographic reproductions, either of art, or of nature, or of people or gods. We now recognize reality and history as having authenticity, for the purpose of art making, if certified by photography, since their identical reappearance in different places and time parallels the way in which society lives the basic modes of production and consumption of goods. 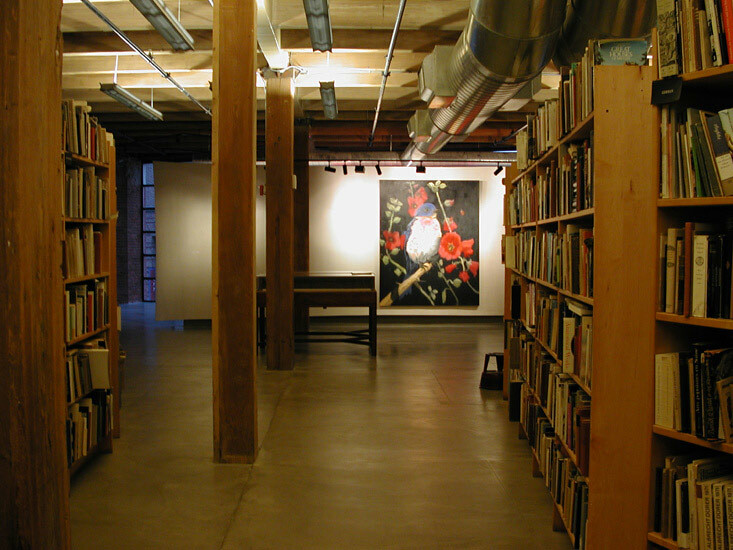 Even if Ann Craven does not inject in her work a program of pointedly critiquing, or ironically mimicking, this interaction that mass-produced objects and media-produced images have with social consciousness, her method of a different repetition or repeatability of an icon – birds and deers, for instance- certainly inscribes an ideology of lyrical visitation of essential processes of re-production. 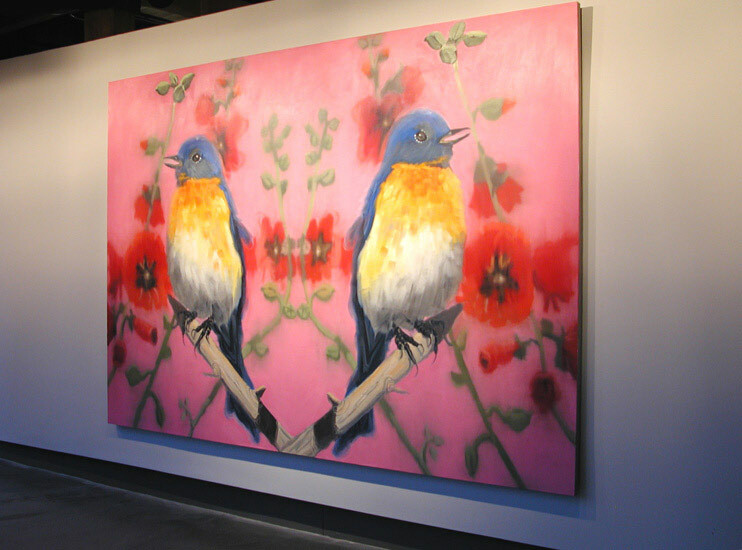 The fact that she juxtaposes, as in the two pictures exhibited here, a photography-derived image (the Eastern Bluebird in the foreground) to one drawn from nature (the hollyhocks in the middle ground), and a representational field (the bird/plant pattern) to an abstract one (the non-naturalistic, though portraiture-inferring, pink or black background), conveys that she is indeed forever complicating a systemic approach to images with an intuitive elaboration of the mode of painting. On the other hand, the insistent reworking of a single icon has been, from the Byzantine Madonnas to the Qur’anic inscriptions, and from Warhol’s Jackie’s, Marilyns, Maos, and self-portraits to Halley’s cell-and-conduit sociograms, an art-historical model to which Ann Craven has suddenly impressed a new twist. The difference consists in that her iconic repetitions are based not on metaphysics, photography, or design, but on a painterly brushwork-as if she were defying a taboo that identified painterliness with representational or abstractional uniqueness and considered the expressivist distinctions of the brush marks incompatible not just with seriality, but also with the intensive (re)production of an identical yet constantly re-experienced act. The replicant method is further carried by Ann Craven from the repeated image to the picture’s enactment, for this appears to retrace, in its still unique articulation, the entire history of post-World War II painting: the actionist gesture of Abstract Expressionism (for the forceful gesture brought to each individual brushstroke in the modeling of the birds); Pop Art’s reliance on the typology of mass produced images for its subject matter (with the lifting of her imagery from ornithological books); the fixed spatial relations of Minimalism (for the iteration of an identical gestalt in a number of canvasses); Conceptualism’s primacy of mind over matter (for the central role that Ideas play in the unfolding of her body of work); the emphasis brought by Neo-expressionism on the inscription of constructed images with historical resonances (for her descent into the Birdworld as amounting to the imprinting of an archetype); Gerhard Richter’s photo-based, frozen and blurred Romanticism (for the moody alternation of misting and sharp focusing in the figuration of the plants in the middle ground of the canvas). As if unfolding and modeling a drama from a cartoon, Ann Craven discovers a further avenue to life and meaning in everyday themes that we may have glanced at as lifeless and meaningless. In Bosch’s circa 1470- 90 triptych known as the Garden of Earthly Delights, now in the Prado, birds were present, in both a realistic and a fantastic form, at the creation of Adam and Eve, and are therefore, when in a pristin condition as in Ann Craven’s pictures (where they are lifted from naturalistic handbooks), an essential emblem of Earthly Paradise. Being apparently untouched by evolution and acculturation, having the same colorful and delightful selves now as they had the emergence of homo sapiens some 50,000 years ago, they are at least as new and immaculately concepted as Koons’ vacuum cleaners enshrined in Plexiglass boxes. In a word, Craven’s birds were also present at the creation of Painting, for they are entirely about an image’s need to become archetypal, and a picture’s desire to be an act of objective existence, a model of magical resistance to the obsolescence of the object. 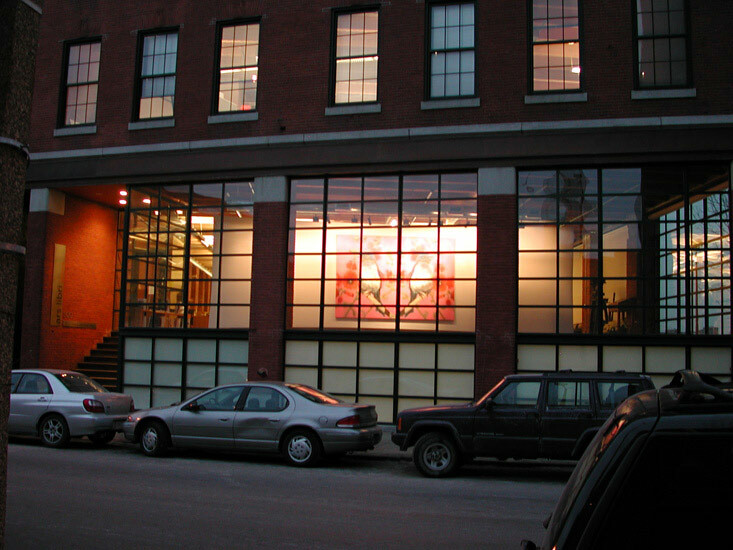 Both This way No This way (Aut Aut) (2003, oil on linen, 84 x 120 inches),and Nevermore(2003, oil on linen, 90 x 72 inches), the two works shown here, repeat differently an earlier icon from 2002, Hit Song Bird. Usually, Craven’s pieces enact the difference in repetition by changing the canvas’ scale or the color of the flat background. But also the number, shape, density of the brushstrokes change from one replication to another, as well as the tonalities of both the fore-and background, if the picture’s colors and scale remain the same. 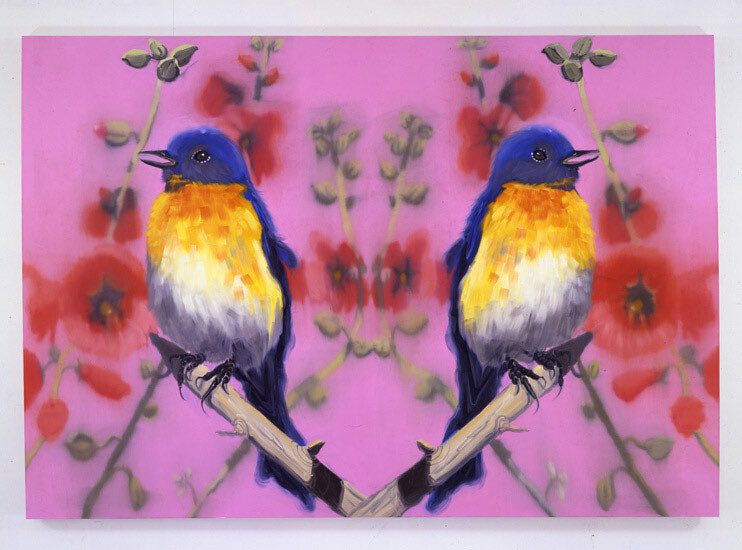 In Hit Song Bird, the ground was of a light blue and the dimensions 72 x 48 inches, while in This way it is an intense pink and in Nevermore is black. The bird appearing in all three pictures is an Eastern Bluebird- its long bill open; the head, closed wings, and tail’s feathers of a marine blue; the large eyes, in the middle of a gray area, highlighted by a make-up of white dots; the throat of a bright red, changing to orange in the breast and to ashes and sometimes purple in the abdomen; the black feet clutching a leafless, broken brown branch. Behind the bird, three spikes of a hollyhock fade into the background, always in the same pattern, their moody red flowers withering wide open but the top buds suddenly coming into sharp focus, probably for no other reason, beside internalizing Richter’s alienated Romanticism, than to emphasize the cycle of life and death in nature. 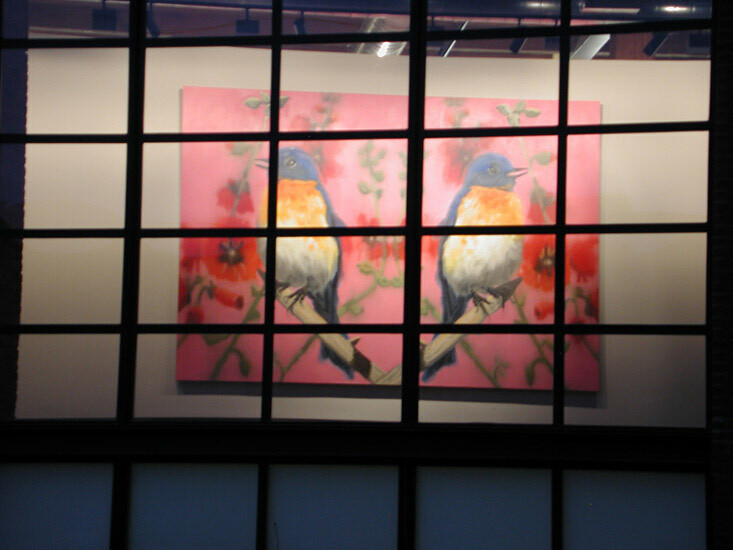 This way, however, repeats for the first time the Eastern bluebird twice eon the same canvas, one a symmetrically reverse image of the other, like in a Rorschach test, the two branches meeting at the bottom of the canvas to perform a perfect V. While the hollyhocks joined at center create a continuum backdrop, the two birds staring in opposite directions keep in perfect tension their almost alchemical unity of the contraries, and translate their “either/or” visual trope in an inscrutable iconography.